If there's one man that's changed the face of wearables, it's James Park. The CEO of Fitbit started the company back in 2007 and has turned the company into one of the great success stories of the last decade. And when it comes to wearables, its success is unrivalled. In the UK, Fitbit enjoys an incredible 90% market share, and the company floated for $358 million when it went public in 2015. It is credited with shifting 5.7 million devices every quarter and perhaps the greatest accolade is that to many consumers, "Fitbit" has become a colloquial term for fitness trackers in general. But the company has had its fair share of issues too. User rashes, shareholder jitters and a handful of lawsuits over accuracy have also meant Fitbit has hit the headlines for the wrong reasons. We caught up with James Park at IFA 2016, and started off by tackling the big question about Fitbit's heart rate accuracy. "It's accurate to say that we're probably taking the brunt of all this because we're the leaders," he said. But Park admits that Fitbit (and other optical sensors) aren't up to the standard of chest straps quite yet – and that it could take years to exceed their accuracy. "I think we're probably a few years out from, dare I say it, exceeding the performance of chest straps. "I think [heart rate monitoring] devices are pretty close…when they work. But what we have seen is that there's a lot of other devices out there which refuse to give you a reading if it's too difficult, so what's the point in having a sensor if it's not working 100% of the time. "We're very confident in the accuracy of our products," he continued. "I mean that plaintiffs, lawyers, whoever, can run as many tests as they want to put people in the worst possible light, but if you look at third party and consumer reports they place the device as 'very accurate'. I think that no-one's publicly ever done this, but if you benchmarked us against other heart rate devices on the market, there would be pretty surprising results." One of the big criticisms of Fitbit's range is the lack of GPS on its devices (other than the ageing Fitbit Surge, of course) and this seems all the more perplexing when even by Park's estimates, running is one of the key activities from Fitbit users. "With the addition of heart rate, we're seeing more people engaging in cardio activities. Running is the big one," he told us. "You have to understand why people run with their phones – it might be music, it might be the ability to make emergency calls. You're better off letting the phone do what it does best and that's GPS, and letting the wearable do what it does best which is notifications and seeing the display in real-time when you run." But that reluctance to follow the likes of Garmin in integrating GPS for runners doesn't mean the company isn't innovating with sensors. The Charge 2 harnesses VO2 Max and heart rate variability (HRV) to monitor stress, and Park says this is just the beginning. "It's the start of our focus on how sensors can be applied to wellness. HRV, which is what the Relax app is based on, is a new metric for us which took a lot of algorithmic development," Park explained. "What I can say is that future sensors we develop will unlock more wellness and stress management functionality. We have a good idea of where sensors and machine learning technologies are heading." 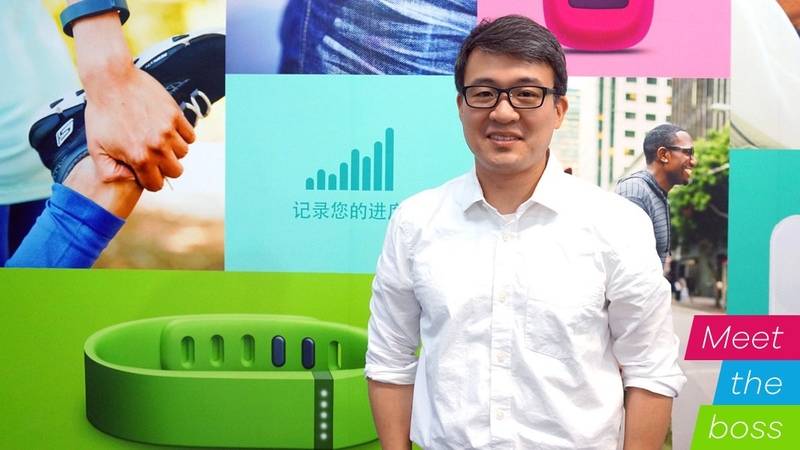 While most people would think that the fitness trackers are a new fad, Park has spent nearly 10 years at the helm of Fitbit. We asked how he felt the industry had changed. "What we're finding is that there's no one-size-fits-all, so that's one of the biggest changes we've seen," Park said. "Consumers have got more sophisticated, and so we have had to broaden our own line-up of products." Another big change is how important women embracing wearable tech has become. Park believes that Fitbit is one of the few tech companies "with a heavy female interest", which he believes is a big opportunity, with the company "doubling the market". "You can tell by how heavily we've focused on the accessories strategy. So if you look at Flex 2 which just came out, there's a lot of focus on accessories and partnerships with fashion brands Tory Burch and Vera Wang." Collaborations and fashion partnerships have been a big focus for Fitbit, and Park told us that he hasn't had to work that hard to get fashion brands involved. "The very first time was Tory Burch," he said. "It was her team that reached out to us, because many of her staff were avid Fitbit users. So they saw the opportunity to develop accessories when we announced [the Fitbit Flex] and it was hugely successful. The accessories sold out within hours, we got approached by other fashion brands and that really opened the floodgates for us." "I think it will be difficult to call the market in five years fitness trackers or smartwatches, or whatever industry experts want to characterise it. Fitbit will always be health and fitness focussed first. But I do see a lot of general purpose functionality being weaved into the experience over time, so you can't see general purpose devices vs fitness tracking devices. They're going to look pretty similar," he said. Yet Park's vision for the company is more data, more sensors and more analysis: "We want to be integrated with healthcare systems around the world. And I think these devices with more sophisticated sensors really have the chance to impact people's health outcomes. "In 2020 Fitbit should be like seatbelts and airbags in automotive technology today. You'd be crazy to buy a car without one, and one of the goals of Fitbit would be to say 'hey, it's crazy to leave your house without a Fitbit because it could literally save your life.'" And while Park and his company may have changed the face of wearable tech, he says that complacency won't be its undoing. "We still have dominant market share, but even where there's no competition, we still have a healthy sense of internal paranoia, so we're not going to slacken off."